Recently, I stumbled upon a study about how 7 minutes high intensity exercise can replace 1 hour workout at a gym. We are talking health benefits here. I would not replace a lovely bush walk or energising dance class with this. But, I’m working long hours and I’m studying acupuncture. Why not to try this!? 12 exercises, ~30 seconds to complete each bout, 100% intensity. I can keep 100% intensity only for about 4 minutes. Then, I start slowing down (just as the researchers told me). The slower the pace, the longer you have to do it. To start with, most of us will need to persevere for 14 minutes for each workout to get the most benefit. Trust me, if you do it often enough, soon you will be able to breath through it! I found the high intensity exercises to be most helpful. I have more time to study, work and play. After a 7 minutes routine right here at home, I feel energised and focused. It’s such a great way to keep fit when your schedule is busy. No need to feel guilty if you have no time for the gym. You can do this routine anywhere. All you need is a chair, a wall and 7 minutes. Generally, the longer the exercise duration, the lower the exercise intensity can be accomplished. So get ready for 7 uncomfortable, but rewarding minutes and get fit. Please read the study for further info and contraindications. 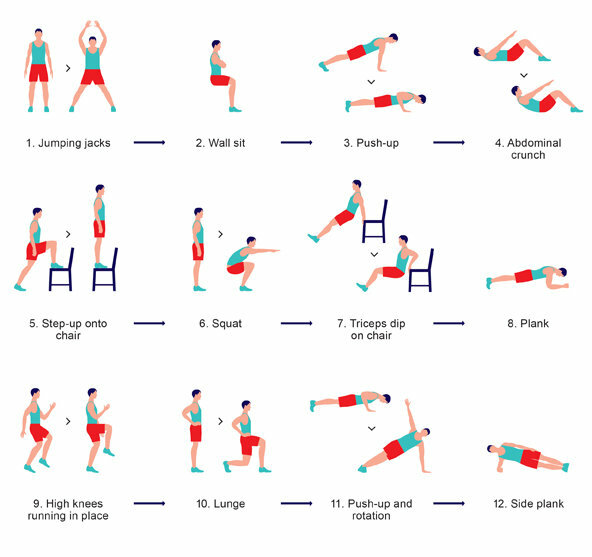 Would you like to learn more about 7 minute workout? Call us now.